If your are working on a project and you need to see the overall picture of the solution you are working on, then you might first think about taking a look at the UML diagrams! But if you only have the source code and some Visual Studio Express edition (Express Editions have no class diagram :( chipped with them), then looking for a tool to generate class diagrams for .NET assemblies will be your only option. Although class diagrams are not too precise like UML diagrams, but they help too much in understanding classes relations and give you the picture of the solution. There are many UML and Class diagrams generators for Visual Studio and .NET but most of them are not free. Autodiagrammer is a free and open source tool that uses Reflection to generate class diagrams, it's pretty fast and give very useful results! 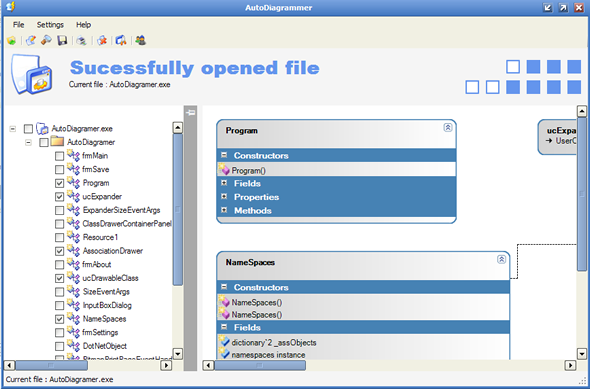 you can read more about how it works, and download it here : http://www.codeproject.com/KB/cs/AutoDiagrammer.aspx. Posted in class diagram, Visual Studio . Bookmark the permalink. RSS feed for this post.